Didius Julianus (Latin: Marcus Didius Severus Julianus Augustus; 30 January 133 or 2 February 137 – 1 June 193) was Roman emperor for nine weeks during the year 193. Julianus ascended the throne after buying it from the Praetorian Guard, who had assassinated his predecessor Pertinax. This led to the Roman Civil War of 193–197. Julianus was ousted and sentenced to death by his successor, Septimius Severus. Julianus was born to Quintus Petronius Didius Severus and Aemilia Clara. Julianus's father came from a prominent family in Mediolanum (Milan) and his mother was a north African woman of Roman descent, from a family of consular rank. His brothers were Didius Proculus and Didius Nummius Albinus. His date of birth is given as 30 January 133 by Cassius Dio and 2 February 137 by the Historia Augusta. Didius Julianus was raised by Domitia Lucilla, mother of Roman emperor Marcus Aurelius. With Domitia's help, he was appointed at a very early age to the vigintivirate, the first step towards public distinction. He married a Roman woman named Manlia Scantilla, and sometime around 153, Scantilla bore him a daughter and only child Didia Clara. In succession Julianus held the offices of Quaestor and Aedile, and then, around 162, was named as Praetor. He was nominated to the command of the Legio XXII Primigenia in Mogontiacum (now Mainz). In 170, he became praefectus of Gallia Belgica and served for five years. As a reward for his skill and gallantry in repressing an invasion from the Chauci, a tribe dwelling in the northwestern coastal area of present-day Germany, in the drainage basin of the river Scheldt, he was raised to the consulship in 175, along with Pertinax. He further distinguished himself in a campaign against the Chatti, governed Dalmatia and Germania Inferior, and then was made prefect charged with distributing money to the poor of Italy. It was around this time that he was charged with having conspired against the life of Commodus, but he had the good fortune to be acquitted and to witness the punishment of his accuser. He governed Bithynia and succeeded Pertinax as the proconsul of Africa. 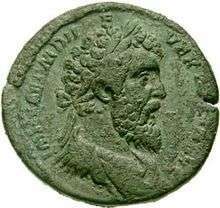 After the murder of Pertinax (28 March 193), the Praetorian assassins announced that the throne was to be sold to the man who would pay the highest price. Titus Flavius Claudius Sulpicianus, prefect of the city, father-in-law of the murdered emperor, being at that moment in the camp to which he had been sent to calm the troops, began making offers, whereupon Julianus, having been roused from a banquet by his wife and daughter, arrived in all haste, and being unable to gain admission, stood before the gate, and with a loud voice competed for the prize. As the bidding went on, the soldiers reported to each of the two competitors, the one within the fortifications, the other outside the rampart, the sum offered by his rival. Eventually Sulpicianus promised 20,000 sesterces to every soldier; Julianus, fearing that Sulpicianus would gain the throne, then offered 25,000. The guards immediately closed with the offer of Julianus, threw open the gates, saluted him by the name of Caesar, and proclaimed him emperor. Threatened by the military, the senate declared him emperor. His wife and his daughter both received the title Augusta. Upon his accession, Julianus immediately reversed Pertinax's monetary reforms by devaluing the Roman currency to near pre-Pertinax levels, decreasing the silver purity of the denarius from 87% to 81.5% — the actual silver weight dropping from 2.75 grams to 2.40 grams. After the initial confusion had subsided, the population did not tamely submit to the dishonour brought upon Rome. Whenever Julianus appeared in public he was saluted with groans, imprecations, and shouts of "robber and parricide." The mob tried to obstruct his progress to the Capitol, and even threw stones. When news of the public anger in Rome spread across the Empire, the generals Pescennius Niger in Syria, Septimius Severus in Pannonia, and Clodius Albinus in Britain, each having three legions under his command, refused to recognise the authority of Julianus. Julianus declared Severus a public enemy because he was the nearest of the three and, therefore, the most dangerous foe. Deputies were sent from the senate to persuade the soldiers to abandon him; a new general was nominated to supersede him, and a centurion dispatched to take his life. The Praetorian Guard, long strangers to active military operations, were marched into the Campus Martius, regularly drilled, and trained in the construction of fortifications and field works. Severus, however, having secured the support of Albinus by declaring him Caesar, progressed towards the city and made himself master of the fleet at Ravenna. He defeated Tullius Crispinus, the Praetorian prefect, who had been sent to halt his progress, and gained over to his cause the ambassadors sent to turn his troops. The Praetorian Guard, lacking discipline and sunk in debauchery and sloth, were incapable of offering any effectual resistance. Matters being desperate, Julianus now attempted negotiation and offered to share the empire with his rival. Severus ignored these overtures and pressed forward, all Italy declaring for him as he advanced. At last the Praetorians, having received assurances that they would suffer no punishment – provided they surrendered the actual murderers of Pertinax – seized the ringleaders of the conspiracy and reported what they had done to Silius Messala, the consul, by whom the senate was summoned and informed of the proceedings. The senate passed a motion proclaiming Severus emperor, awarded divine honours to Pertinax, and sentenced Julianus to death. Julianus was deserted by all except one of the prefects and his son-in-law, Repentinus. Julianus was killed in the palace by a soldier in the third month of his reign (1 June 193). Severus dismissed the Praetorian Guard and executed the soldiers who had killed Pertinax. According to Cassius Dio, who lived in Rome during the period, Julianus's last words were "But what evil have I done? Whom have I killed?" His body was given to his wife and daughter, who buried it in his great-grandfather's tomb by the fifth milestone on the Via Labicana. ↑ In Classical Latin, Julianus' name would be inscribed as MARCVS DIDIVS IVLIANVS AVGVSTVS. 1 2 Cassius Dio, lxxiv, 17.5. ↑ Historia Augusta, Didius Julianus, 9.3. ↑ Historia Augusta, Didius Julianus, 1.3. 1 2 Historia Augusta, Didius Julianus, 1.4. ↑ Historia Augusta, Didius Julianus, 3.4. 1 2 Historia Augusta, Didius Julianus, 1.5. ↑ Historia Augusta, Didius Julianus, 1.6. 1 2 Historia Augusta, Didius Julianus, 1.7. ↑ Historia Augusta, Didius Julianus, 1.8, 2.3; Pertinax, 14.5. ↑ Historia Augusta, Didius Julianus, 1.8. ↑ Historia Augusta, Didius Julianus, 1.9. 1 2 3 Historia Augusta, Didius Julianus, 2.1. ↑ Historia Augusta, Didius Julianus, 2.2. ↑ Historia Augusta, Didius Julianus, 2.3; Pertinax, 4.1, 14.5. ↑ Cassius Dio, lxxiv, 11.1; Historia Augusta, Didius Julianus, 2.4, 2.6. ↑ Cassius Dio, lxxiv, 11.3; Herodian, ii.6.8. ↑ Cassius Dio, lxxiv, 11.5. ↑ Cassius Dio, lxxiv, 11.5; Historia Augusta, Didius Julianus, 2.7; Herodian, ii.6.11. ↑ Cassius Dio, lxxiv, 12; Historia Augusta, Didius Julianus, 3.3. ↑ Historia Augusta, Didius Julianus, 3.4, 4.5. ↑ Tulane University "Roman Currency of the Principate". ↑ Cassius Dio, lxxiv, 13.2–5; Historia Augusta, Didius Julianus, 4.2–7; Herodian, ii.7.3. ↑ Cassius Dio, lxxiv, 13.3. ↑ Historia Augusta, Didius Julianus, 4.2, 4.4. ↑ Cassius Dio, lxxiv, 14.3–4; Historia Augusta, Didius Julianus, 5.1–2. ↑ Historia Augusta, Didius Julianus, 5.3; Septimius Severus, 5.5. ↑ Historia Augusta, Septimius Severus, 5.5. ↑ Historia Augusta, Didius Julianus, 5.4–8. ↑ Cassius Dio, lxxiv, 16.1–2; Historia Augusta, Didius Julianus, 5.9; Herodian, ii.11.9. ↑ Cassius Dio, lxxiv, 15.1–2. ↑ Cassius Dio, lxxiv, 16.5; Historia Augusta, Didius Julianus, 6.3. ↑ Historia Augusta, Didius Julianus, 6.4. ↑ Cassius Dio, lxxiv, 17.1; Historia Augusta, Septimius Severus, 5.6. ↑ Cassius Dio, lxxiv, 16.3. ↑ Cassius Dio, lxxiv, 17.2; Historia Augusta, Didius Julianus, 6.9, Septimius Severus, 5.7; Herodian, ii.12.3. ↑ Cassius Dio, lxxiv, 17.3. ↑ Cassius Dio, lxxiv, 17.4; Historia Augusta, Didius Julianus, 8.7; Herodian, ii.12.6. ↑ Historia Augusta, Didius Julianus, 8.6. ↑ Cassius Dio, lxxiv, 17.5; Historia Augusta, Didius Julianus, 8.8. ↑ Cassius Dio, lxxv, 1.1. ↑ Historia Augusta, Didius Julianus, 8.10. Wikimedia Commons has media related to Didius Julianus. Wikisource has the text of the 1911 Encyclopædia Britannica article Didius Salvius Julianus, Marcus.